Back-to-school means big savings during tax-free weekend. Many of you probably already have your weekend shopping list prepared so you can shop smart, save big and stock up on items you and your kids have been dying to get your hands on! However, one thing you may have left of your tax-free weekend planning agenda is your travel plans during one of the busiest shopping days of the year. That’s where we come in! Leave the hassle of driving, annoying traffic and finding parking behind and #RideDCTA for your weekend shopping extravaganza. We’ve listed the top shopping spots in Denton County that we can get you to for all the tax-free weekend shopping festivities, as well as easy rider tips to remember for a great DCTA travel experience. Shop the latest trends, visit an array of dining options and have fun with family and friends at this unique and convenient shopping mall located along the I-35 corridor near the University of North Texas (UNT) and Texas Woman’s University (TWU). Remember that our Denton Connect Route 2 only operates on Fridays and Saturdays. Originality, local style and hidden community gems can all be found in downtown Denton. From delicious eateries, antique and unique finds and chill atmosphere – you’ll be glad you came to visit! Don’t forget that our Denton Connect Routes 7 and 8 only operates on Fridays and Saturdays. The new shopping center in town is the buzz of the town! If you’re looking for shopping at trendy stores, pick up a quick bite to eat or enjoy a movie at Alamo Draft House, this is the place for you. Keep in mind that our Denton Connect Routes 4 and 7 only operates on Fridays and Saturdays. One of the premier shopping centers in Highland Village, it has a variety of retailers and restaurants to partake in and enjoy. Please note that our Highland Village Connect Shuttle service is only available this Friday, August 10, from 5 a.m. to 10 a.m. and 3 p.m. to 9 p.m., and our Highland Village Lyft Discount program is available Friday, August 10, from 5 a.m. to 7 p.m. Here is where you’ll find everything – from the largest retail chains to interesting one-of-a-kind specialty shops! This popular northern Dallas area mall has 1,000,000 square feet of shopping delight, plus 15 movie theater, food court, two levels of atriums, fountains and wide, accommodating walkways. Remember that our Lewisville Connect Route 22 only operates on Fridays and Saturdays. If you’re craving antiques, casual dining and old-world charm, take a ride to this revitalized downtown district town for your unique shopping experience. Get lost in the comfortable, hometown ambience and escape the hustle and bustle of big shopping malls here! Don’t forget that our Lewisville Connect Route 22 only operates on Fridays and Saturdays. Plan Ahead – Be sure to check your route’s arrival times before heading out for your shopping trip, arrive at your stop at least five minutes earlier than the scheduled arrival, and have your fare on hand. Keep our end-of-day schedule in mind too so you won’t risk missing the last train or bus back home. Need travel help while out shopping? Contact our customer service team at 940.243.0077 available Friday from 5 a.m. to 7 p.m., and Saturday from 8 a.m. to 4 p.m. Pack (and Dress) for Shopping Success – Summer time is hot, so make sure to pack some water in a spill-proof container to help keep you refreshed and hydrated. Also, don’t be the person who didn’t “dress for success.” For more extra comfort while riding our system, wear comfortable shoes and dress for the appropriate weather! Keep Track of Your Ride – Know where you ride is at all times with our Transit Tracker tool which provides real-time information on our A-train, bus, and shuttle service arrival times via web browser, text message or by phone when you dial in for automated voice information. Download the free Transit Tracker mobile app from Google Play or Apple iTunes for instant information on transit-vehicle locations, nearby stops, step-by-step transit directions and notifications about when to leave for your next trip. Don’t Buy More Than You Can Carry – If you plan to buy a lot of items (or some bulky ones), please bring a folding cart for your shopping bags. If you don’t have a cart or choose to bring one, we ask that you only carry on two bags maximum. Rest assured we are mobility-convenience friendly if your trip requires the use of a folding cart, wheelchair, stroller, bike, or other type of carriage, we’re ready and able to accommodate you! Remember DCTA Fare Deals Too – The deals aren’t only at the stores! If you’re riding our A-train, some sections are free and don’t require fare. Also, we have reduced fare options for seniors (65+), persons with disabilities, Medicare cardholders and students ages five through 18 (students over the age of 14 require a valid high school or DCTA issued ID). Children under five can ride free with a fare-paying adult! 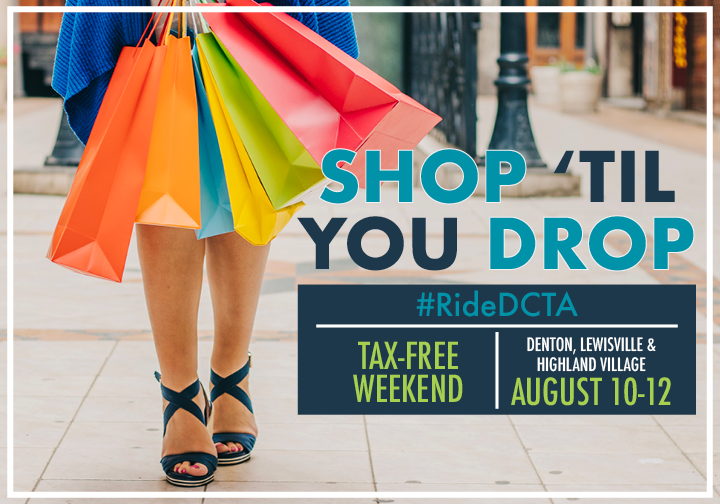 Tell us in the comment section below where you plan to #RideDCTA to this weekend for your fun, tax-free shopping! Thanks so much for your feedback! One of our key rider tips we included in this post was to “keep our end-of-day schedule in mind too so you won’t risk missing the last train or bus back home” in the “Plan Ahead” section of our post. We definitely concur and don’t want anyone to be stranded!